Become a member and enjoy free admission all year long plus an impressive list of other members-only benefits! Find out more about becoming a member of The Discovery. Admission to The Discovery is just $5 per person after 4:00pm every Wednesday. And, best of all, the museum is open until 8:00pm. For more information, visit our calendar of events. The Discovery offers a $1 per person general admission discount for groups accompanied by a Veteran or Active Duty member of the military. The Discovery opens at 9:00am every Wednesday for Small Wonder Wednesday, an hour just for families with children age 5 and under. See calendar of events for details. The Discovery is open on Mondays from Memorial Day to Labor Day, on national holidays, and during Washoe County School District school breaks. To find Mondays when the museum is open, visit the calendar of events. The Discovery participates in the Association of Science-Technology Centers (ASTC) reciprocal admission program. Find out more here. 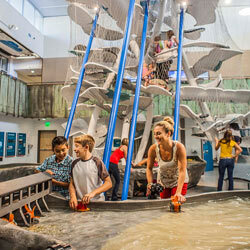 The Discovery offers special admission rates and programs for school field trips and groups of 20 or more. Find out more here. Exit at N. Sierra Street (Exit 13) and turn right, heading south. Drive approximately 1 mile and turn left on Liberty Street, heading east. Drive three blocks and turn right, heading south, on Sinclair Street. Enter parking lot immediately on the right. Exit at N. Virginia Street (Exit 13) and proceed to N. Sierra Street. Turn left on N. Sierra, heading south. Drive approximately 1 mile and turn left on Liberty Street, heading east. Drive three blocks and turn right, heading south, on Sinclair Street. Enter parking lot immediately on the right. Exit at Mill Street (Exit 66) and turn left, heading west. Drive approximately .5 miles and make a slight left turn onto Ryland Street. After approximately .5 miles, make a slight left turn onto E. Liberty Street. After .2 miles, turn left on Sinclair Street, heading south. Enter parking lot immediately on the right. Exit at Mill Street (Exit 66) and turn right, heading west. Drive approximately .5 miles and make a slight left turn onto Ryland Street. After approximately .5 miles, make a slight left turn onto E. Liberty Street. After .2 miles, turn left on Sinclair Street, heading south. Enter parking lot immediately on the right. The Discovery is located on RTC’s Rapid Connect route. For a map and schedule for that route, please visit RTC’s website. Looking for a gift that lasts all year?